I found myself upping the ISO on some handheld macros on a recent trip to Bentley Woods. The light was okish , and I had only taken my 100mm lens along, as I was hoping to find some co-operative Pearl Bordered Fritillary Butterflies to photograph. Alas, although there were a few about, none posed particularly well, and the bluebells this year were much passed it, in comparison to other years in mid-May. So as I walked around further on the wood in a further fruitless hunt for a Marsh Fritillary, I did find some smaller insects to shoot. Normally I’d use some flash with small insects to help freeze their movements, but without them I resorted instead to upping the ISO to 1600 for some of them. This is the first time, I’ve used such a high ISO to shoot natural light macros, (normally I’d use ISO 400 or less). However despite several failed shots, due to insect / me blur, I am pleased with these results. The noise on the Canon 650D was surprisingly well controlled, and I probably would get away posting them straight out of Adobe Camera RAW, but I have also used a JPEG Moderate preset from Topaz Denoise 5 to smooth what noise there was from the shots. 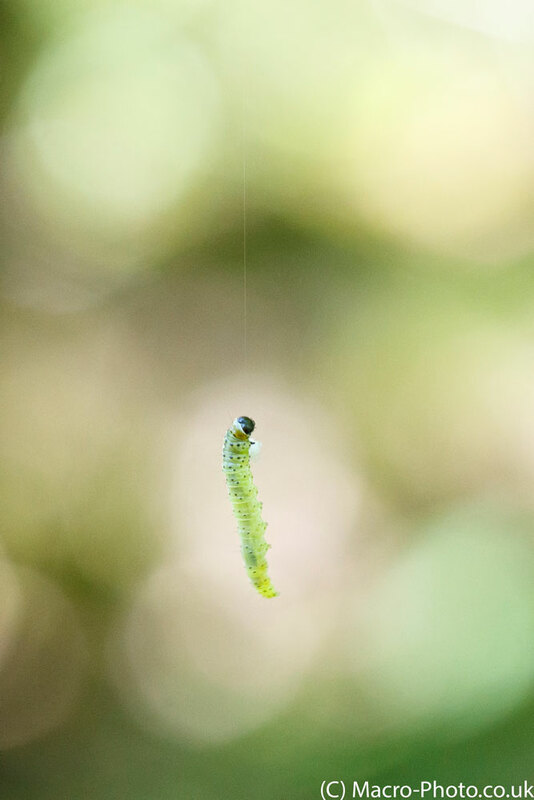 The first shot was of this free swinging caterpillar, dangling on it’s silk thread from a tree. It proved a bit of challenge with the wind that was blowing it about, but this one is workable I think. A small crop to get more of it in shot on this occasion as I was fairly backed off on the 100mm’s magnification. Caterpillar hanging by a thread. Taken on Canon 650D with Canon 100mm F2.8 USM Macro Lens. ISO 1600 F5.6 1/250 in Natural Light.(Cropped). 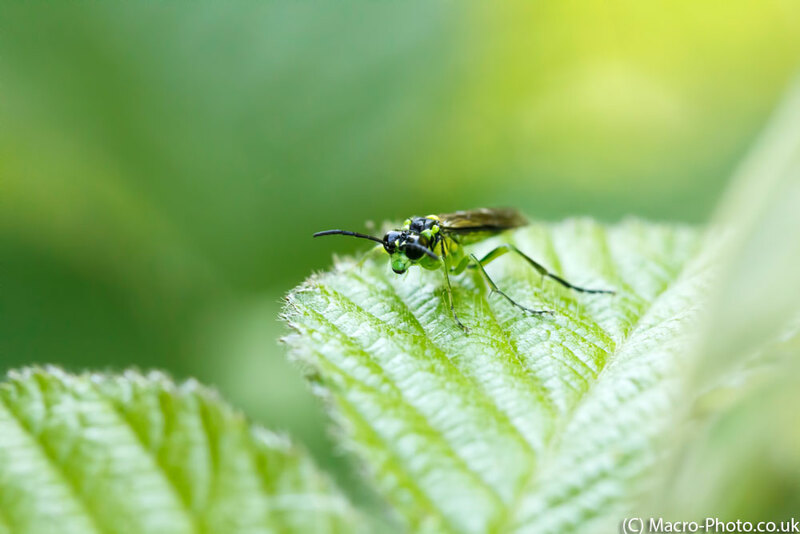 Following on from that I found a green sawfly, which was moving around some nettles. I have to admit to taking about 60 shots of it and only getting a few sharp ones. Again the wind was not helping, and the sawfly was moving about a fair bit. Hence, had I had a flash with me, this would of been almost nullified due to the short exposure duration you get with flash. However the natural light does give a different and perhaps more pleasing natural background. Sawfly – Tenthredo mesomela. Taken on Canon 650D with Canon 100mm F2.8 USM Macro Lens. ISO 1600 F7.1 1/125 in Natural Light. 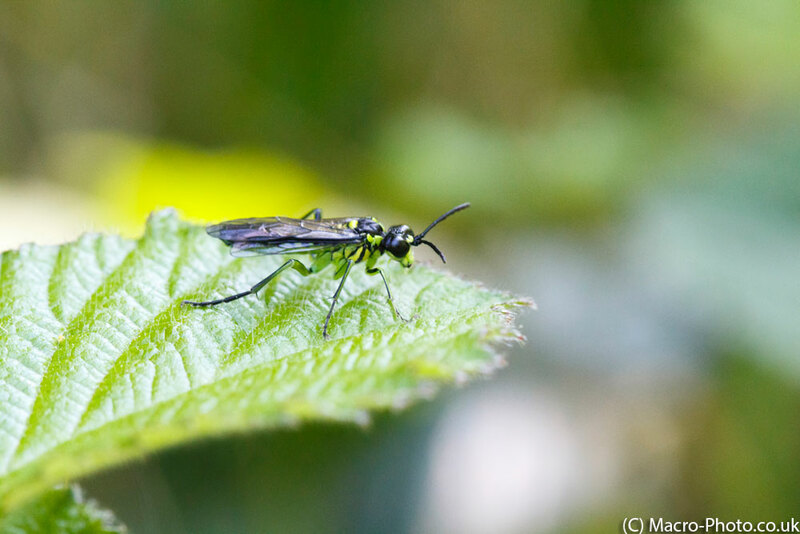 Sawfly – Tenthredo mesomela. Taken on Canon 650D with Canon 100mm F2.8 USM Macro Lens. ISO 1600 F5.6 1/200 in Natural Light. Sawfly Face off – Tenthredo mesomela. Taken on Canon 650D with Canon 100mm F2.8 USM Macro Lens. ISO 1600 F5.6 1/250 in Natural Light. I then saw this beetle on the base of some thick stems – and I think it gives a fairly minimalist look. In this shot the ISO is a much lower 400. 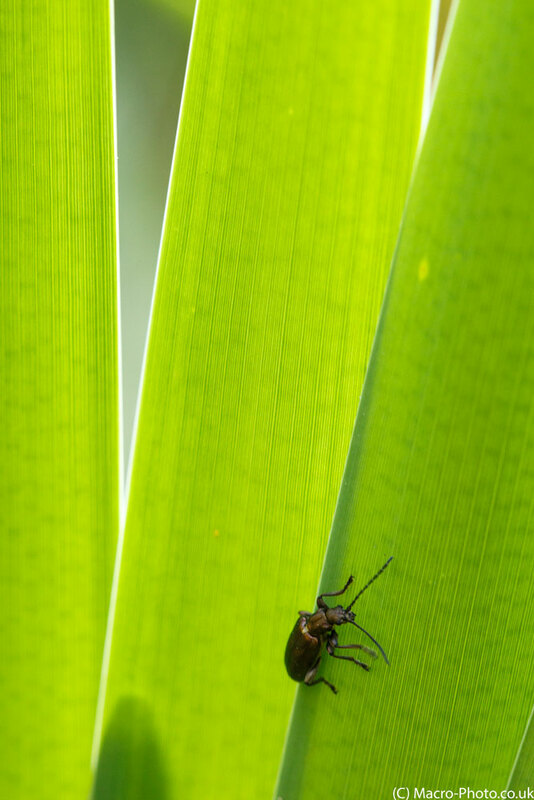 Beetle on Leaves. Taken on Canon 650D with Canon 100mm F2.8 USM Macro Lens. ISO 400 F6.3 1/50 in Natural Light. 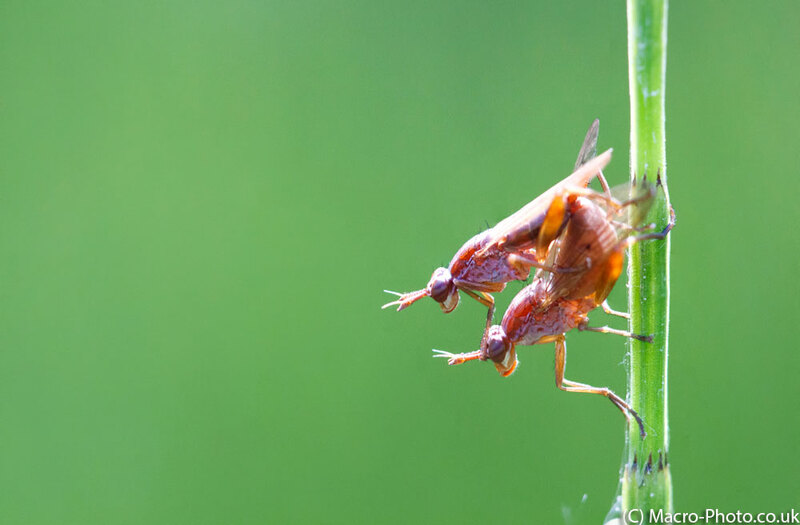 Finally, I came across two mating ( and as yet unidentified ) flies mating. Two shots are stacked in this one, which I did in Photoshop CC. Mating Fly Stack. 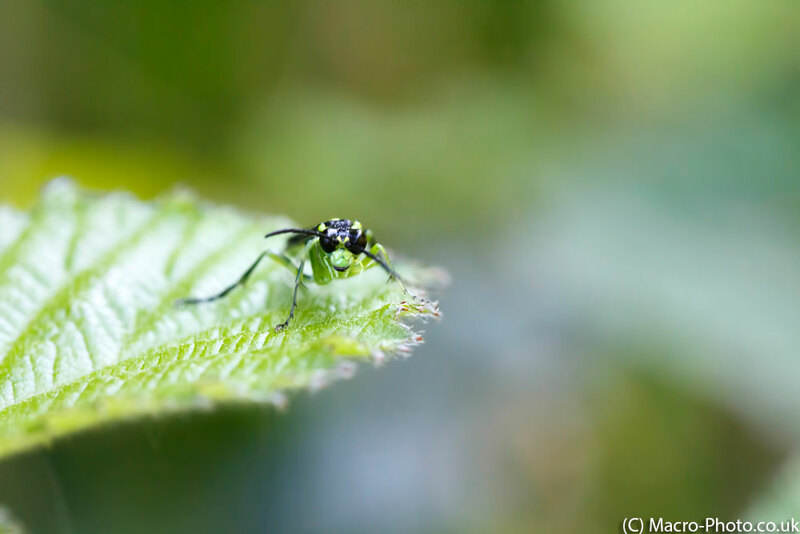 (2 Shots stacked in Photoshop CC) Taken on Canon 650D with Canon 100mm F2.8 USM Macro Lens. Both shots ISO 1600 F5 1/250 in Natural Light.